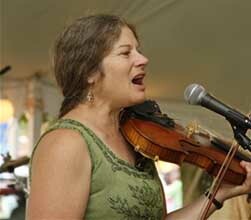 Pam sings and plays several instruments in the folk trio, T-Acadie, is fiddler and singer for the Maine-based Cajun dance band, Jimmyjo & the Jumbol’Ayuhs, plays fiddle and mountain dulcimer in the contradance band, Scrod Pudding, and performs solo or with guitar player and caller Bill Olson. She is an accomplished tunesmith and has composed scores of tunes, from lively jigs and reels, to entrancing airs and beautiful waltzes. Pam has toured throughout the U.S. with her bands, playing for contradances, concerts, and teaching at festivals and workshops. She has three recordings of her own, one with Scrod Pudding, and is featured on several others. Pam teaches mountain dulcimer, fiddle, viola, cello, guitar, flute, saxophone, piano, celtic harp, and voice in her studios in Turner and Bath, ME. 43 Starbird Corner Road, Bowdoin, ME. 04287 phone: 207-666-3709 For more info on Pam, check out her website at www.pamweeks.com.